Even in these challenging times, I’m filled with hope and inspiration. Never more so than when standing outside the White House in the stifling heat this summer with thousands of others gathered to protest Trump’s cruel family separation policy. As everyone chanted, “This is what Democracy looks like!” I knew we were part of something much bigger. Together, we were just one of hundreds of protests across the country that day building a movement to transform our society. That gave me strength. I also knew that as a leading civil liberties organization, Defending Rights and Dissent had our backs. That’s why we want you to donate generously today. We know to the core of our very being that protest and dissent change the world for the better. That’s why it’s more important than ever to support DRAD, which is fighting every single day to defend your right to dissent and protest. 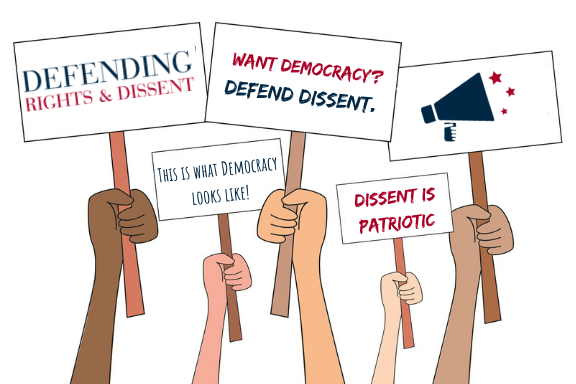 Supporters tell us that Defending Rights & Dissent helps them speak truth to power. They feel empowered to join with others — in the streets, at community meetings, to send an email, or call elected officials. That is what democracy looks like. We’re especially hopeful today because we have a matching grant from The Tikva Grassroots Empowerment Fund. They are so excited about our work they’ll match your donation dollar for dollar up to $10,000. Please take a moment to donate now! Your support means we can keep fighting hard so you can keep fighting for what you believe in.